Just a simple twist on an old favorite. I love how a snip of fresh herbs spruces up just about anything. Visually, a sprinkle for garnish adds professional panache, and hidden somewhere in the dish, lends a lurking note of freshness. That goes for desserts as well. 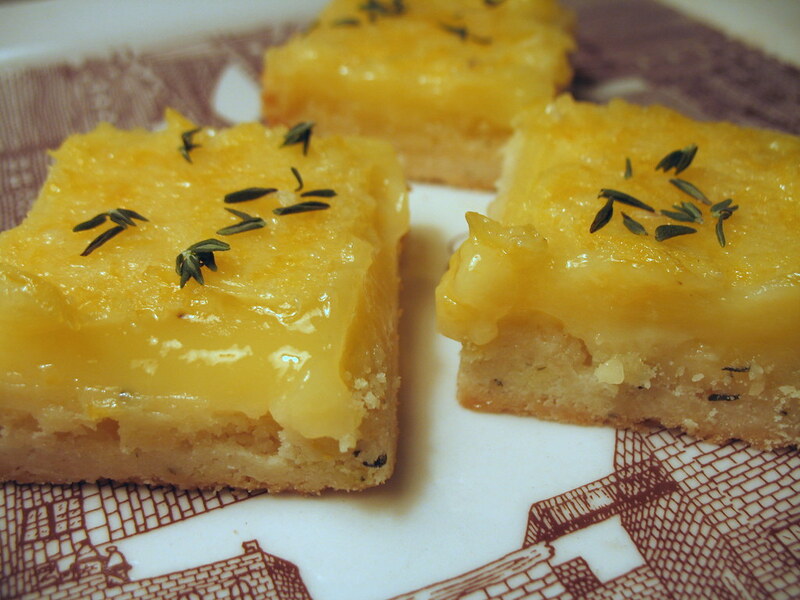 Not that lemon bars necessarily need a lot of sprucing up. Fresh-squeezed tart juice with zest and bits of pulp suspended in a cloudy custard atop buttery shortbread never fails to hit the spot. I don’t think I’ve ever made these before, with or without thyme, nor really knew what the lemony layer on top was supposed to consist of. 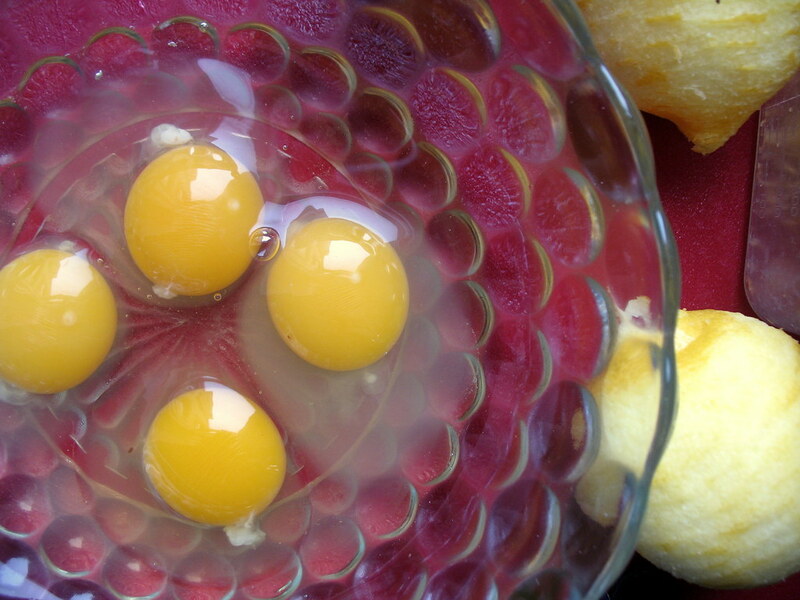 It’s eggs that give it that sunny color, for the most part, and the consistency of a thick gel. Most recipes advise to dust lemon bars with confectioner’s sugar, maybe to cover up the unmistakably eggy-looking crackled top. 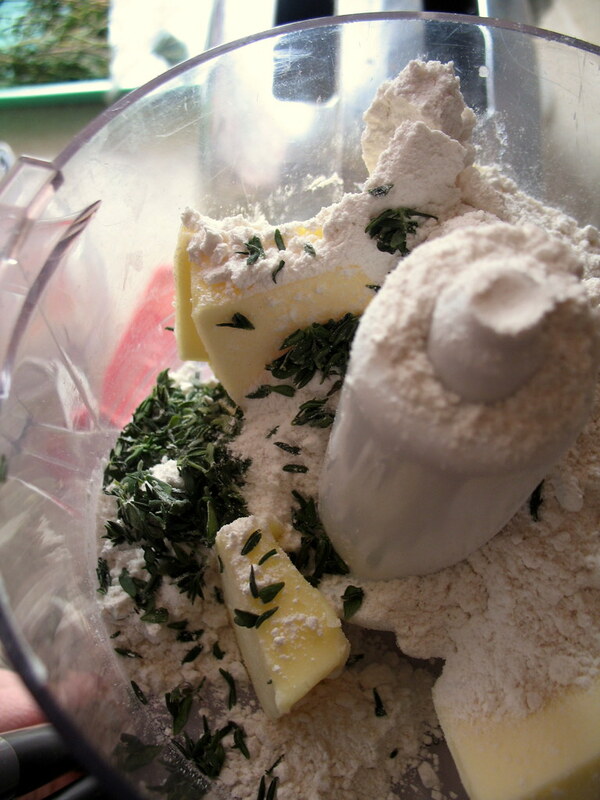 But since I’d already blended the herb into the crust, I just sprinkled some more fresh thyme on top. It was a last-minute call to come up with this dessert and a last-minute flourish for the thyme. My friend Gino celebrated his twenty-eighth birthday last night, and I already knew someone was making an extravagant cake. Another friend was bringing cupcakes, too. I didn’t want to crowd the table with another frostinged thing. Now that the method behind making these lemon bars is down pat, I’m curious to try it out with other fruits next. What about strawberries when they arrive in June? Melons much later on in the summer? I’m thinking tart gooseberries, currants and blackberries are another viable option. We’ll see what my CSA has in store. For now, I’ll allow that while lemons are neither local nor seasonal, somebody really struck gold when they came up with this dessert. As usual, my friends gobbled them up at lightning speed, and wondered afterward what those savory sprigs of something were on the surface. To make the crust, combine the ingredients in a food processor and pulse until mixture resembles coarse crumbs (or cut in butter with a pastry cutter or your fingers). Preheat oven to 350 degrees. Press mixture into a slightly greased 9 x 13″ casserole. Bake for about 15 minutes or until the edges are lightly browned. Remove from oven. 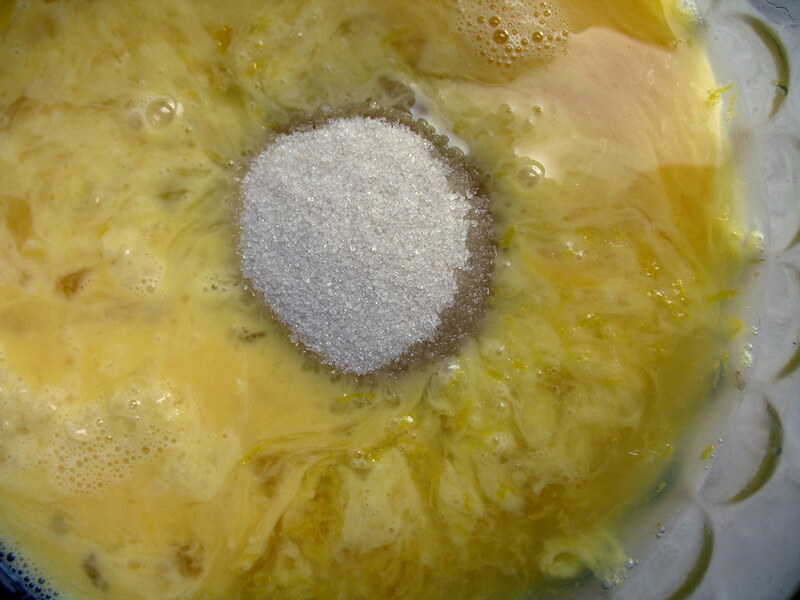 In a large bowl, combine the eggs and flour and gently beat with a fork until there are no lumps. Stir in the rest of the ingredients. Pour mixture on top of the baked crust and return to the oven to bake at 350 degrees for another 15 minutes, or until the top has just set. Let cool completely. For neatest results when cutting, cover and chill at least 30 minutes before cutting into squares. 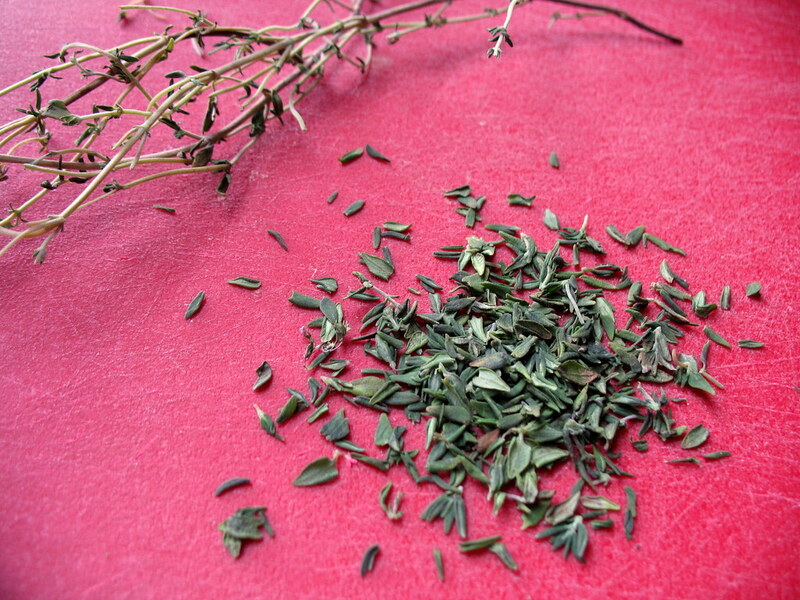 Sprinkle tops with thyme for garnish. 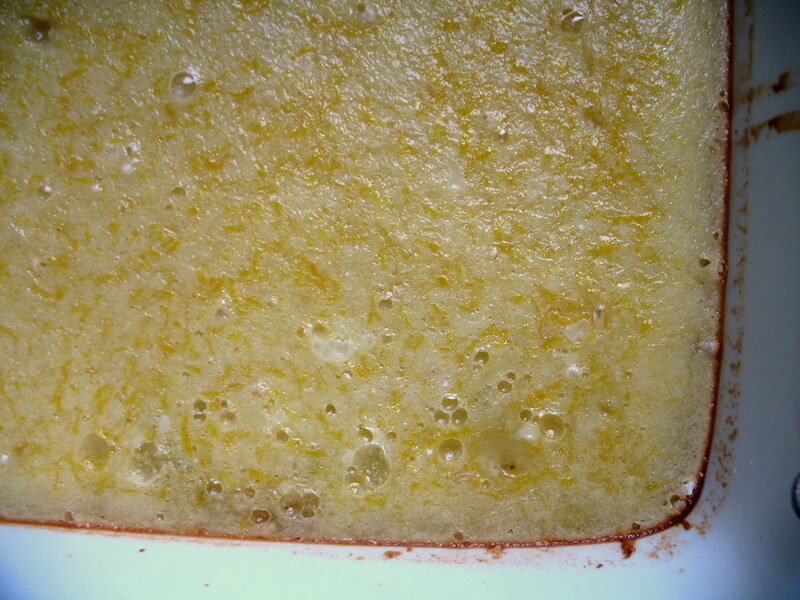 Eight brownie points: While half a cup of fresh lemon juice definitely adds a good dose of Vitamin C, and a sprinkle of thyme is a great alternative to more sugar for garnish, this dish definitely has its share of sugary calories, and the shortbread crust is no less buttery than any cookie or pie pastry. Three maple leaves: Not looking good. As lamented above, lemons come in fossil fuel-burning cargoes from California. But the good thing is that while they’re definitely the highlight flavor-wise, much of the stuff in the dessert — eggs, butter, a bit of milk — can be sourced locally. What a lovely flavor combination! They look great. 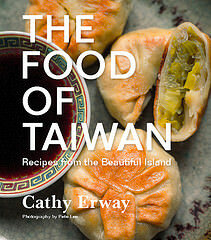 I just discovered your incredible blog, and I’m so glad I did! 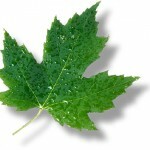 I love the philosophy behind your blog, and I love your brownie points, maple leaves, and cost calculator features! THOSE are some handsome eggs! High yolks, nice cloudy whites. Good lord. Francis: I know! Those eggs are from the chickens who were attacking me a couple posts down, at Queens County Farm. Oh my word these put my lemon bars to shame. Picking thyme leaves is easy if you don’t do it one leaf at a time. Just do it the same way you pull rosemary leaves off (hold the top of the sprig with one hand and pull the leaves toward its bottom with the other). It just takes a little bit lighter touch. These would be really great, as those two flavors go together really well. Something else you could do would be to use lemon thyme rather than just regular thyme. I love lemon thyme — it’s got a slightly gentler, sweeter flavor than regular thyme. Will try these great sounding bars this week.